We'll help finish what you started. Some of our best customers are Do-It-Yourselfers (DIYers). Intelligent, independent and handy, DIYers challenge themselves to learn new things. Being useful is satisfying. And HGTV and the DIY Network make it look so easy! But, there are some jobs that – for safety’s sake – should be left to professionals. If you get stuck, frustrated or need to use your plumbing now – call us: it’s Western Reserve Plumbing to the rescue! Don’t wait if you find yourself with a slow drain; it will only get worse. Still clogged? If the drain is a sink, you’ll need to clear the U-shaped pipe underneath – the trap. 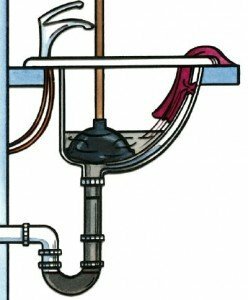 If the clog is farther down the pipe, try a plunger or auger (plumber’s snake). The plunger loosens the clog so it can go down; the auger twists into the clog to break it up. Create a seal with the plunger and work it up and down quickly for 30 to 60 seconds, being careful not to lose the seal. The pressure should pull the clog loose and allow it to go down the pipe. All drains should have covers, especially those in the shower, which should have “hair guards” found at the drugstore or hardware store for a couple of dollars.